She had walked into my room while I was watching “It Happened at the World’s Fair” in the corner of the monitor. Just got it the other day. 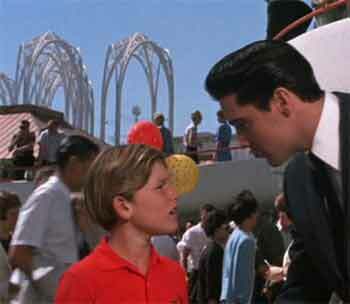 My first and only Elvis movie; I’m not a big fan of the King’s movies, but this one was shot on location at the 62 Seattle Fair. Lots of location shots, which is the reason I bought it. I expected the usual tuneful romp, but it had an unexpected twist: Our Hero Elvis the Good hitches ride to Seattle with an Asian produce hauler and his niece. The uncle entrusts the child to Elvis’ care for a day – here, take this child and vanish into the numberless crowd, Mr. Shiftless Hitchhiker! Meet you at five. Later the uncle disappears, and the child sets out to find Elvis at the Fair. Naturally she finds him. Child Protective Services intervenes; Elvis must fight Authority to keep the child by his side. Women must have loved this stuff. Guys were bought off early with a fistfight at card game, and reassured in the final reel when Elvis really beats the crap out of a criminal who’s smuggling (ominous Dragnet sound effect) mink pelts. She grew up to be the First Lady of Hawaii. Dig that crazy milk container. 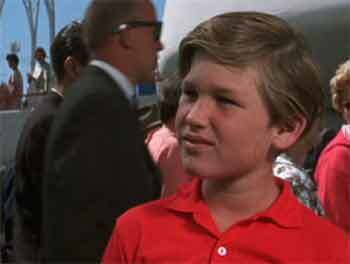 Later, in a scene where Elvis rescues the little girl – she ran away from Child Protective Services to wait for Elvis in a concept car; could this be any better? 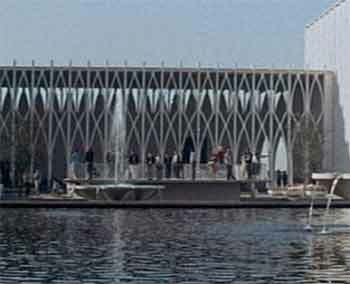 – they spring through this colonnade. Look familiar? The arches were the architect’s trademark. He would later refine the idea. 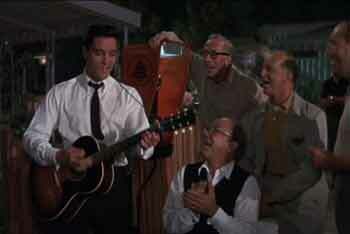 I wondered why one musical number featured four middle-aged guys harmonizing with Elvis; who were they? Whoa: Look at the guy by the phone. Google the credits: sure enough. That’s Thurl. You know, Thurl! He wasn't just good. He was grrrreat. 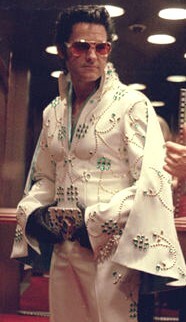 In one scene Elvis pays a small kid to kick him in the shins so he has a good excuse to go to the dispensary and act all Elvis with a hot nurse. It’s the movie equivalent of Bill Clinton shaking hands with JFK, isn’t it? What, you don’t recognize him? You didn’t see his breakthrough movie, “The Computer Wore Rhinestones”? 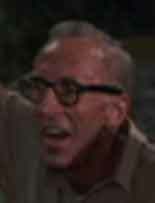 It's Kurt frickin' Russell, friends. Finally, an image that sums up 1963 better than anything else I’ve seen. 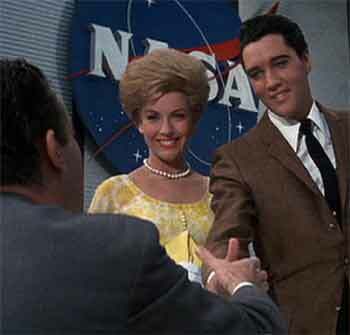 Elvis enlists with NASA at the World’s Fair. It would take 20 years before we achieved this level of swagger and swank again.